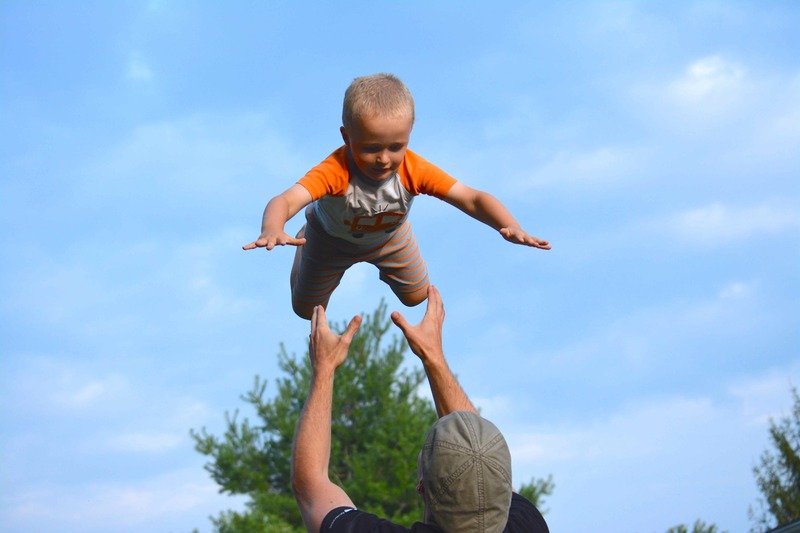 Eli, 3, lands in his Dad’s hands after a flying high. Later, as the photos showed, Eli was not comfortable with getting his wish. “Me next!” he’d shouted after watching his father throw his little sister high into the air. She’d landed each time in her father’s strong hands with glee on her face and giggles that said: Again! Again! Of course I’d taken photos. That’s what I do. In my life I seem to fear losing the sweet memories of family because they’re rare these days. So if it happens in my presence, my Nikon and I go to work. And being home in the Shenandoah Valley for 10 days meant grabbing hold of every moment of family that I could get. It wouldn’t be long before I would be back in Port-au-Prince in my role as a mission co-worker with the Presbyterian Church (USA). Justin was grinning along with the rest of us as he tossed Violet, 18 months old, into the air, I don’t know, 50 gazillion times. He’s tall and strong, so he wasn’t showing any wear. But when 3-year-old (a big 3) Eli and Ella, 6, wanted in on the action, he smartly took a breather. “OK,” he said. “First one into pajamas and back out here goes first.” The bigger kids scampered into the house while Violet sat calmly in Justin’s arms. He put her on the ground and stretched his arms. In about that much time, Ella had raced back onto the deck screaming that she was first. You’ve got to love kids. Within seconds, Eli was out in his jammies and watching his sister get ready to take the highflying leap. In the quick procession of pics I took, I saw that, while he waited, Eli stepped uneasily from one side to the other. While he shifted his weight to each foot, his arms went up like a bird’s wings, then slowly back his side. The seemingly fearless little guy was nervous! With her Dad’s coaching words still in her ears, Ella squatted a bit, then jumped and Justin lifted and …. Up she went! High into the air! And down she came, landing softly into Dad’s waiting hands. Waiting anxiously was little brother. Just like his Dad requested, while Justin’s hands were under Eli’s arms, Eli jumped, Justin lifted and there he went – up, up, up! And down. And just as he was safely lowered to the ground — in tears. “It scared me!” he cried. And he ran up the stairs to the deck and onto his Grandma’s lap. I knew I’d gotten the pics, and as I passed my sister, Peggy, and Eli, I heard her softly saying: “I know that scared you, Eli. You went up so high! It’s been almost two weeks now. I have the photos and so many more. I’m back in Haiti, and I look through them often, remembering those large moments of family and small moments of love. Here in Haiti my colleagues and I serve God in trying to help the people here better their lives. We couldn’t do it without our faith. We couldn’t do without the care and love and support of so many. And we couldn’t do it without knowing — and sharing — the steadfast knowledge that as high as we are tossed, whether it’s what we want, we will land safely. Our Father has caught us. Our Father will always catch us. A journey across Haiti Blog at WordPress.com.